The Best Top Coat- We HAVE a WINNER!!! | Polish Me, Please! I am a firm believer that any nail polish -from the $1.99 drugstore finds to the $20 Chanel bottles- can look awesome with a good top coat. When the OPI Shatter collection first came out I loved the effect but hated the nasty melted-tractor-tire finish! Shame on people (especially nail techs!) who wear that with no top coat!!! Anyway, I went on the hunt for the shiniest top coat. Also, I wanted one that would help my nails stay strong and not chip, because believe me, I’ve rocked the chipped black or red polish before, but it’s not the look I’m currently going for. After trying several different kinds (including but not limited to: Sally Hansen Diamond Shine, OPI “top coat,” and Ulta clear) the best top coat is…. 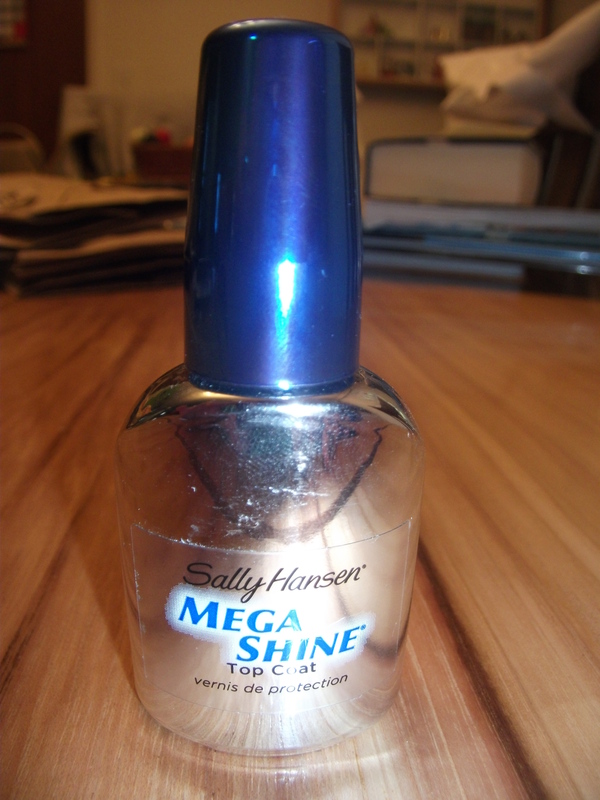 XXXXdrumroll please!XXXX…..
Sally Hansen Mega Shine Top Coat- the best I have found! I love this stuff!! In fact, I love it so much that I always keep an extra bottle handy. As soon as one starts getting low and I’m thinking about opening my back-up bottle, I run to the store and use my $1 off coupon that almost always seems to be in the Sunday newspaper and get a NEW backup bottle. I can not live without this stuff. Well, I’d live, but not as prettily. SH Mega Shine is the best because not only is it super shiny (it’s way shinier than OPI!) but on the back of the box it comes in, it says it fuses all the layers of your nail polish together to form one tough, shiny layer… and it really does. It seems to melt all your polish together into one hard-as-glass beautiful shiny manicure. The only tip I’d give you concerning it’s ability to fuse together layers of polish is, if you are using it over nail art that includes fine lines I’d slap a normal (OPI, Ulta, whatever) topcoat on first because Mega Shine can sometimes cause a fine line to smear a tad. Another good thing about this is that wearing this top coat will keep my manicure PERFECT (minus the slightest edge wear) for at least 5 days. I’m a substitute teacher so after school I don’t have grading to do, so I do whatever the teacher asks me to which often includes cleaning students’ desks. Have you SEEN a kindergartener or first grader’s desk?? It’s as if they just swipe the glue stick over the entire surface, then grind some sandbox sand into it and harden it with a blow torch… they are NASTY!! And I will sometimes scrub those bad boys down with a Clorox wipe, using my nails to scrape the gluey residue from Hell off. With this top coat, my nails stay awesome all week. The kids are always complimenting me on my nails, and let me tell you, they look GREAT on the document cam! Haha. Now, I usually re-coat my nails after about 3 days because I’m obsessive and want them to keep looking fresh, but this stuff is seriously armor for your nails. The other great thing about it is if you put a nice solid layer (don’t be shady, now, give your nails a good coating!) they will be dry to the touch (watch out for imprints) in a minute or two. I would give up the drying time and even the wear-ability of it if it was just as shiny as it is, but luckily it has all three. I know I’m sounding like an advertisement, and trust me, if I could get my hands on a lifetime supply and not have to run to the store for it every couple of weeks, I’d love it, but you don’t have to take my word for it… get the $5-7 dollars it costs and try it for yourself!! Pingback: Ulta Jungle Look- Review | Polish Me, Please! Pingback: Who’s your mummy?! Halloween Nail Art from a beginner :) | Polish Me, Please! Pingback: Sally Hansen Mega Shine vs Seche Vite- The Jury is Still Out | Polish Me, Please! Pingback: Glitter Gradient Nails | Polish Me, Please! Pingback: The Secret to Shiny, Long-lasting Nails | Polish Me, Please! I just bought it to replace my Seche Vite but I’m kinda getting matt tips when I apply it. Do you get that too? Other than the matt tips I really LOVE the drying time and how you can smooth it out if you accidentally bump into something while drying. Hmmm I do not have that problem with mine. Mine is super duper shiny all the way. Are you having shrinkage? Make sure to wrap your tips to avoid that. Otherwise I just don’t know. If you have Twitter you could tweet me a pic but I just don’t know what to say about that. I’m sorry I’m not very helpful! I use this too, and between Sally Hansen Mega Shine Top Coat and the acclaimed Seche Vite Dry Fast (which I own and use and causes shrinkage in certain cases), I prefer this one. Yay! It’s more accessible to me too, I can get it from drugstores. I heard someone complain about this product's visibility, not being able to see the polish inside, so you can't see if you're running low… please, you know when nail polish is running low. Sally Hansen tests their I gradients on animals. I wish you would update your “winner” to one that’s a bit more humane. Wowwww! Witty and snarky AND smart! Triple threat!!!!! In all seriousness, thanks for the info. Maybe you have the answer to this question for me- in one way or another, wouldn’t most products be tested on animals? Here’s my line of thinking on that- so my target brand apricot facial scrub says not tested on animals, but is that possibly because the same product only under a different brand HAS been tested so it makes it unnecessary for them to do it? Or maybe the individual ingredients have been tested in the past so now they know they’re safe and don’t need to test the final product..? I don’t want to be contributing to animals being harmed, but I’m wondering if it’s even possible to have something that’s seriously never been tested on animals. Well.. truth be told, I wasn’t trying to attack Textvomit with my reply. However, I just hate it when such ridiculous lies are spread, especially about our good girl Sally! >:T Don’t spew criticism unless you know what you’re talking about, you know? Anyway, yeah.. I know what you mean, and your concern is valid. I haven’t researched every beauty/make-up/cosmetic brand there is, but I do know some helpful tips for your type of concern. Like… Obviously, I can tell that you know quality, so you don’t just buy cheapo products, you buy the good, reputable stuff. The thing is.. with those major brands, those reputable ones, since they’re so popular among so many ladies, beauticians, and even celebrities, they’re more or less forced to be “up to snuff”, especially when it comes to such a spotlighted issue like animal testing. These brands would be so under pressure, as it were, that they’ll even monitor and make sure that their suppliers don’t test any of their ingredients on animals either, so I’d say you’re safe. If you’re really really worried, just quickly check the company’s website, if they don’t mention that they’re ZERO animal testing, stay away from their products, because it is illegal to say that you don’t test your products on animals if you actually do, and if a company doesn’t do animal testing, they’ll make it pretty clear. So yeah.. as long as you stick to those brands that you know and trust, and don’t delve into those mysterious “lower” brands, you have no worries. ^^ When I said that Sally Hansen is free of any animal testing, I meant ANY, none. The ONLY exception is some less-developed countries who buy Sally Hansen products, and then test them on animals, sadly. <:( However, Coty is trying their best to rectify this, because they do not condone it at ALL. Awesome! Thanks for all the info. Do you have a beauty blog/twitter/IG or did you just stumble upon this post by accident? Well I’m glad you stumbled upon it. 🙂 Thanks for all of your input. If you ever start one let me know… I like your attitude!! Haha. It’s such a bummer that we have to wait to apply this AFTER our nail color is fully dry. But hey, if it shines like the claims say it does, it could be worth it. Here’s to hoping! I just apply mine as soon as I’m done painting, so I don’t think your nails really have to be dry. If you find that this doesn’t work well on just painted nails, try SV, that’s what I use almost exclusively these days. Seche’ Vite works great if you apply it to pretty fresh paint since waiting for it to dry will cause shrinkage but I am never totally satisfied with its shine. I will try this out my next bottle. Thanks for the info.